Axles: (recall 15V-552) The original factory-fitted axles were too narrow resulting in tire interference on the inside of the wheel wells. There was also a lack of suspension travel and a good jolt could send the tire up through the well into your cabinetry. Initially a fix was offered with different shackles that raised the trailer body but didn’t address the width issue. The recall supersedes this. Confusingly, some dealers installed the new axle with old shackles resulting in incorrect ride heights. This affects both 16’ and 19’ versions, though there are specific part numbers depending on which length you own. Refer to the recall number above for details. If you see any scuffing on the inside of your tires or marks in the top of your wheel wells where the tires have been "bottoming out", have your axle checked immediately! Dinette Support: (recall 16V2-218) Due to production variances, there may not be enough bearing area on the front edges of the dinette benches to support the table when it’s lowered as a bed. The solution adds additional 1x2 strips to the existing supports. In my opinion the factory fix looks like a hack; if you’re comfortable with DIY, tapered ranch casing looks much better while offering the same level of support. Be sure to drill pilot holes and use screws long enough to grab onto the inner bench framing member. Ranch Casing stained and installed. 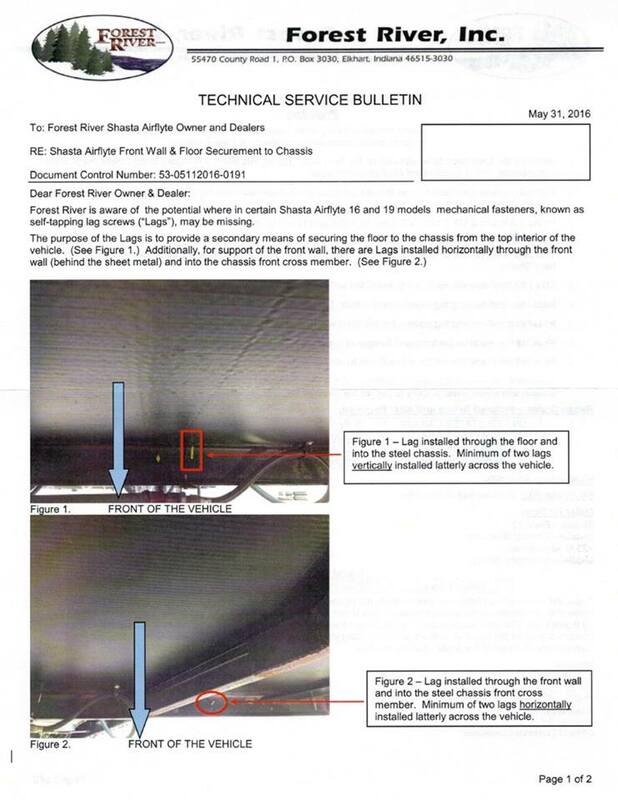 Frame Separation: This is rather important, but is being downplayed by Forest River. TSB 53-0597 affects early production 16' models. The issue is that the front portion of the frame is inadequately supported (welded) allowing the tongue to move independent of the frame members. This can cause the front wall of the trailer to detach, or worse. If you crawl under affected models you can see the angle iron used as the front support has been notched where it fits over the tongue A-frame without any gussetting. Without this reinforcement, these ends will flex along with the corners of the trailer. A surefire test is to jack up and support the front corners of the trailer and attempt to 'bounce' the tongue. If it deflects at all you have a problem. Lag Bolts: This is a service bulletin (53-08112016-0191) and should be addressed if it affects you. 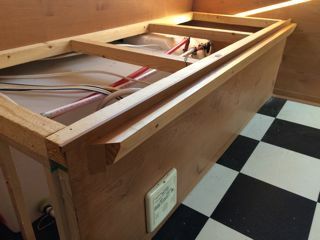 During assembly, the front wall of the trailer is supposed to be attached to the frame with self-tapping lag bolts (really machine driven screws). There should be a minimum of 2 vertically, and 2 horizontally extending through the steel of the frame. My understanding is the lack of bolts is more prevalent on the earlier serial numbers. To fix the issue requires removal of the front skin of the trailer and is a major undertaking. While our trailer has these 4 lag bolts, I plan on adding more. These “bolts” are really just long screws that clamp the wood framing at the bottom of the wall to the chassis’ angle iron and it appears there’s enough deflection to warrant using a wood clamp to pull the front bottom of the wall in and securing from under and behind without removing the metal skin. Crawl under yours, flex the front wall at the base and see what you think. but there's more.... Word is that the earlier made units also have insufficient framing in the front all and this can result in deflection and bowing. While I'm not sure there's an official bulletin on this, some dealerships have addressed this complaint (wall pulling away from the benches is one indicator). The only proper way to correct this is to remove the front skin and add additional wall framing. 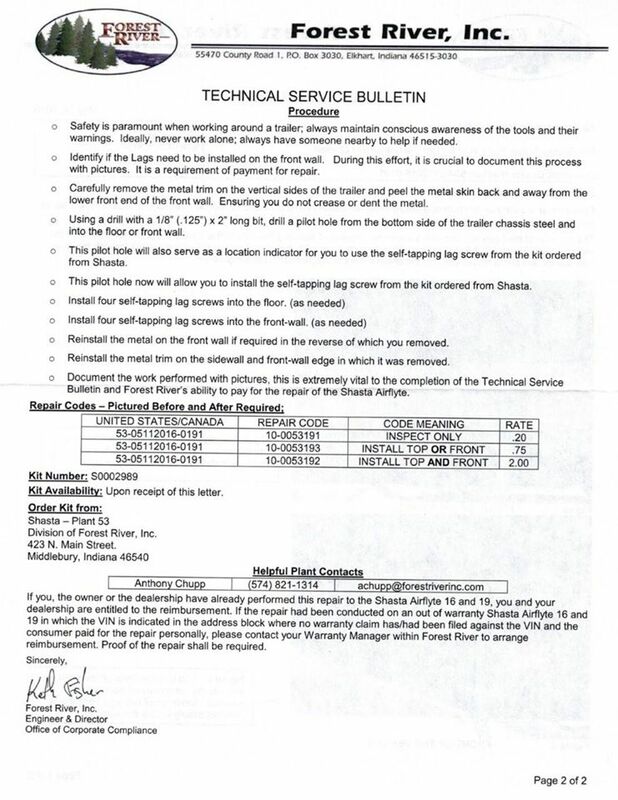 A/C: Service bulletin 54-09032015-0085. This relates to inadequate cooling from the A/C. There are a couple fixes but by far and large is creating adequate ducting to get the hot air out and pull the fresh air in. Don't waste your time with the factory band-aid fix- visit the Appliance Section for more info. 1. The Coker P225/75R15 whitewalls are passenger car rated, not trailer rated. They have a load capacity of 1874 lb each. On a 19’ with camping gear, a full water tank and supplies you could exceed this rating. Some have swapped for trailer tires and used one of the originals as a spare. 2. The tire pressure stickers are incorrect on a number of these trailers. Max PSI should not exceed 35. They are nitrogen filled but you won’t harm a thing by topping off with regular ‘air’. 3. After the axle swap the trailer will sit a little higher. Double check that a 16’ axle wasn’t installed instead of a 19’ and vice versa. Also make sure the correct shackles were used. For a time, there were aftermarket springs and shackles available from outside sources to fix the suspension travel issue before new axles were released. Something to check if you’re the second owner. Note: Bulletins and Recalls updated as of Dec 2016.